The 2017 PARCC Administration will have the same number of test units as in 2016. In addition, the unit times will remain the same. With the change in the assessment at high school, there will be no PARCC Fall Block Administration in 2016. For 2017, the SAT will be administered in paper & pencil format. The assessment includes the essay component. For more detailed information on the SAT components, go to the web link below. For ISA, grades 5, 8, and high school biology will take the assessment in 2017. The SAT does not have a science component. Required training is now open for all users for the 2016-2017 school year. All training needs to be completed by January 27th, 2017. New users need to be added by January in order to complete the required training. It takes 48 hours for an account to be established in Moodle for the required training. If you are new to the district and have completed the training in another district, then please update your user account with your new email address. Required test administrator training for teachers participating in 2016–17 DLM testing is available on a state-driven schedule. The Guide to DLM Required Test Administrator Training (pdf) is a great place to start, with information about accessing the DLM Moodle training site for your first login. Data lockdown begins February 6th, 2017. All rosters, required training, and users must be added prior to this date. All grade level corrections must also be completed prior to this date. 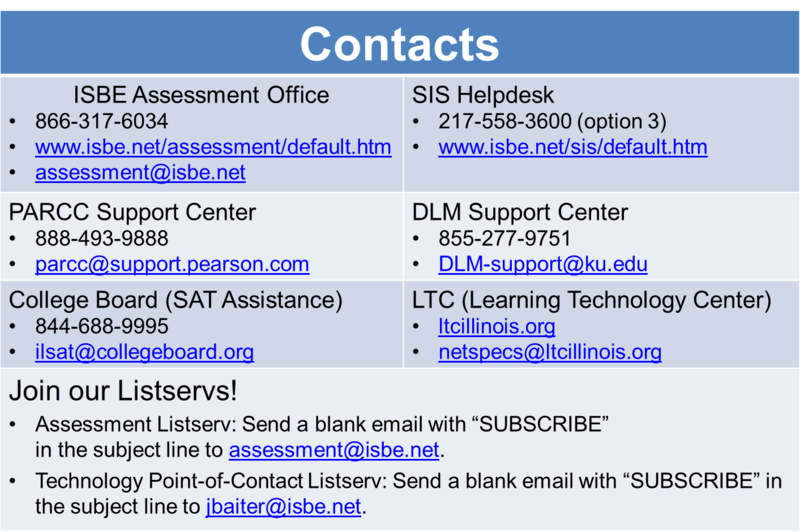 If you are correcting a grade level, please make sure the grade is also changed in SIS. The link below for IL Physical Fitness Assessments and Data Reporting is a great 3 page summary of requirements. This assessment is administered by the Early Childhood Division – 217-524-4835.